Download it for Excel. See the formulas. Learn exactly how it works. Some of the factors NOT considered in this calculator include your other savings goals, income stability, the housing market, etc. The cool thing about this spreadsheet is that unlike online calculators, you can actually look at the formulas to see exactly how it all works. Continue reading below for more explanation. IMPORTANT: People commonly use calculators like this to purchase the largest house they can, but that is often a big mistake. This calculator should only be used for educational purposes and definitely NOT as financial advice. In addition to what the lender might be willing to give you, you should also evaluate your budget using something like our family budget planner to figure out if you can afford the monthly housing payment that these types of affordability calculators report. Buying a home IS complicated. 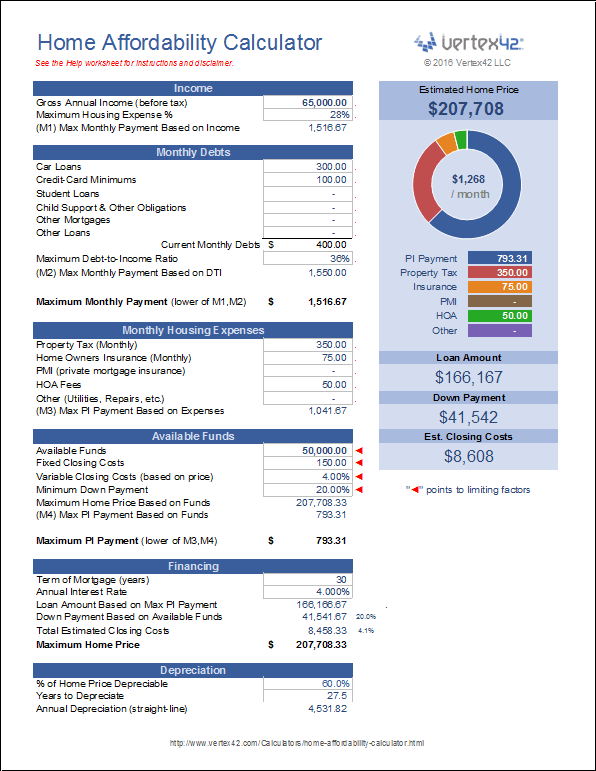 Some tools like this calculator can help simplify and explain things, but ultimately you need to consider all the different factors when making such a huge financial decision. So, we'll step through how this calculator works in detail, but you should also do more research to learn about the other factors involved in home buying. The calculator follows a fairly logical flow, and even though it may be complicated, I've added some logic-based arrows that will point at the limiting factors. So, after you've entered your info you can see what factors (like income or down payment) are limiting the mortgage you can afford. In the 28/36 rule, this is the "36" part. You enter all your current monthly debt obligations, such as car loan payment, minimum credit card payments, student loan payments, etc. These payments, in addition to your new mortgage, cannot exceed the maximum debt-to-income ratio set by your lender. At this point, we take the MINIMUM from Step 1 and Step 2 to figure out the Maximum Monthly Housing Payment. This will be used for Step 3. When we talk about a "mortgage payment" we are often talking about the full PITI payment. PITI stands for Principal + Interest + Taxes + Insurance. The PI payment is just the Principal and Interest portion. In steps 3 and 4 we need to calculate the PI portion of the payment so that we can calculate the maximum loan amount. Side note: The company that services your loan will hold the tax and insurance portion of your payment in escrow and pay those bills when they come due. If you pay off your loan, YOU will be responsible to continue paying the tax and insurance. In this calculator, you need to enter your best guess at the monthly costs for property tax, home owners insurance, private mortgage insurance (PMI), homeowners' association (HOA) fees, and other expenses that you and/or your lender want to consider as part of your total "housing expense payment." These expenses are then subtracted from your Maximum Monthly Housing Payment found after step 2 to calculate your Maximum PI Payment Based on Expenses. This only involves subtraction, so I'm not going to list the formula. Property Taxes: If you are looking at specific houses, you can go online to Zillow.com to find out the exact property taxes for specific houses. Remember that the spreadsheet has you enter the MONTHLY cost. You can do that by entering a formula like =3000/12 if you don't want to use some other calculator to divide the annual property tax by 12. Homeowners Insurance: You can estimate the monthly insurance cost by multiplying the home value by 0.35%. But WAIT! You can't do that in this spreadsheet because that will cause a circular reference. So, at first just estimate the insurance by calculating what it might be for an expensive home (such as =0.35%*500000). Then, if you find that this is a limiting factor, you can adjust it to a more realistic number. PMI: If your down payment is at least 20% of the cost of the home, then you shouldn't need to pay PMI. Otherwise, the annual PMI might be as high as 1% of the current loan amount. Like the other expenses, this may require some iteration if you want to get more precise. HOA and Other Expenses: Your lender might not include costs associated with home repair or utilities. However, if you are being wise, you won't be trying to buy the biggest house you possibly can. You can use these inputs to be more realistic about what you can afford. So, don't assume these costs are zero. You WILL have more expenses owning a home than renting. Be conservative in your estimates (meaning overestimate expenses if necessary). This is something I haven't seen many online calculators do, but it is important. You will need funds on hand to pay both the down payment and the closing costs. So, one of the limiting factors will be your available funds. Closing Costs: This calculator estimates closing costs as a percentage of the home value. You might pay between 2% and 5% of the home value, but perhaps more if you are "paying points." However, you may have some closing costs that are fixed amounts, so you have the option to enter fixed closing costs as well. The total closing costs will be the fixed amounts PLUS the variable costs. When paying points, a "point" means paying an extra 1% of the loan amount up front in closing costs to get a lower interest rate. If you have the funds up front, you might consider paying points instead of increasing the down payment ... but that is an analysis best left for a dedicated mortgage calculator. Down Payment: The down payment is usually one of the main limiting factors in home affordability. You'll need at least 20% down to avoid paying PMI, but you may have a situation where it is okay to make a lower down payment. So, the spreadsheet allows you to adjust the minimum percentage. Now we know the Maximum PI Payment by taking the Minimum of the Maximums from Steps 3 and 4. Knowing the Maximum PI Payment is the key. You can adjust the term and rate in the financing section (which technically was already used in step 4). From that we calculate the loan amount, then the down payment and closing costs, and finally the Maximum Home Price. The results are then displayed in a nice graph. There is also a Depreciation section for those who want to use it, but it can also be ignored. I personally think the coolest feature in this spreadsheet is the use of arrows to point to the limiting factors. Because the analysis is based on the minimum of 4 different maximums, it may not be obvious which of the steps is causing the limitation. Is it income? Is it down payment? Is it the taxes and insurance? Use the Red Arrows to identify what is currently limiting the estimated home price. Yes, I've said multiple times that the goal isn't to get the biggest house you can afford. But, if the calculator is showing that you can't afford ANY house, then you can at least use it to help identify what may be the main limitation. Is it lack of down payment? Or not enough income? Or too much current debt? You may be able to figure some of these things out for yourself, but at some point you'll probably need to talk with a mortgage professional or lender to see what other factors may affect your ability to get a loan. Plus, you may find that you qualify for a special program that gives you a lower rate or a requires a lower down payment. Given how complex and new this spreadsheet is, I give it a 70% chance that there is bug or typo or at least a minor mistake somewhere. However, please do not email me and say that this calculator does not work because your bank will only lend you such-and-such amount. Instead, figure out why they are offering you less. Is it because of your credit score? Is your underwriter calculating your income differently? Have you made a data-entry error in the spreadsheet, such as entering an annual expense number instead of a monthly expense number or vice versa? Remember that this and most other online calculators can't take into account every possible factor that a lender might use to approve a loan. You can look at all the formulas in the spreadsheet to figure out exactly how it works, so please only contact me if you can show that there is a real bug. Not all online calculators do things the same way, so although I've compared this spreadsheet to many and gotten the exact same results, there are plenty of online calculators that I can't figure out (because their algorithms are not visible). Disclaimer: We do not guarantee the results or the applicability of this spreadsheet or the content on this page to your unique financial situation. You should seek the advice of qualified professionals regarding financial decisions. Zillow's Affordability Calculator at zillow.com - This is a very useful calculator if you'd like to get a quick estimate or check the results of the spreadsheet. Costs of Buying a Home at nerdwallet.com - This is an excellent series of articles about the costs and factors to consider when buying a home. Mortgage Affordability at nerdwallet.com - Another good online calculator for a quick mortgage affordability estimate.